Let us pray for all people, in all places, and in every kind of need. We thank and praise you, Heavenly Father, for your manifold gifts to us: gifts earthly, spiritual and eternal. 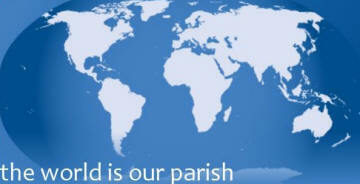 We pray for your church across the world and here in Brickhill. As Christ was baptised with water and by the Holy Spirit, may we be cleansed, filled with your spirit and sent forth to live your Word in our everyday lives. We pray for all people who live in constant danger, especially the people of Gaza, and those in parts of the world where the danger comes from their own rulers and their own people. We pray for people suffering from all kinds of oppression, whether through prejudice, deprivation, disease or exploitation. We pray for people who live in fear of what the current economic recession may bring; for those facing redundancy, the loss of their homes and financial distress. Jesus Christ is the light of the world, a light which no darkness can quench. We remember before God those who have died and light a candle to symbolise the light of Christ, which eternally shines and brings hope. The flame burns today for Donald Charles Rich, Betty Wren and Phyllis Eveline Jones.